ConceptDraw PROJECT ’s powerful reporting engine lets you generate a set of tabular reports with just one click, or visualize your project as Radial Tasks Structures, Work Breakdown Structures and Resource Calendars. 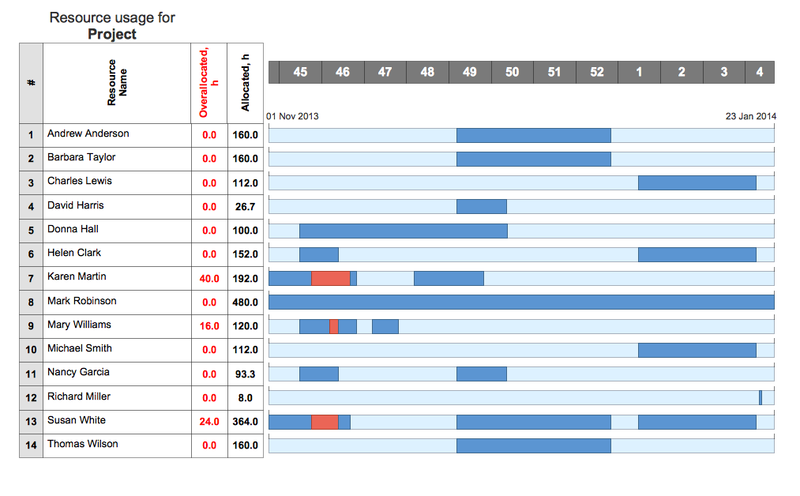 It also provides you with dynamic Project Dashboards. Pic. 1. Project Diagrams gallery. 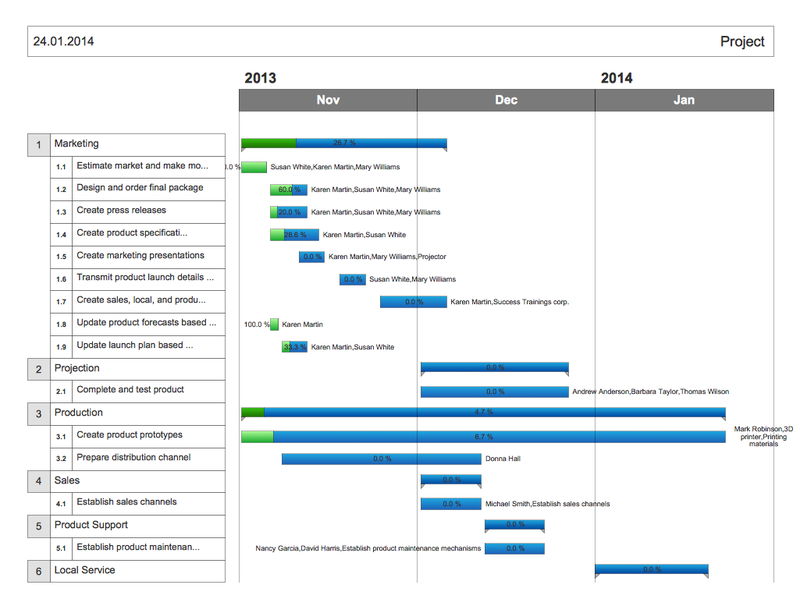 The Gantt Chart diagram presents a basic view of your project. This can help during the early stages of discussion or when presenting to stakeholders. PERT charts allow the tasks in a particular project to be analyzed, with attention paid to the time required to complete each task, and the minimum time required to finish the entire project. The Resource Calendar gives you a two-page document for each resource. The first page is the Resource Usage diagram; the second page is a personal calendar detailing the resource's tasks. 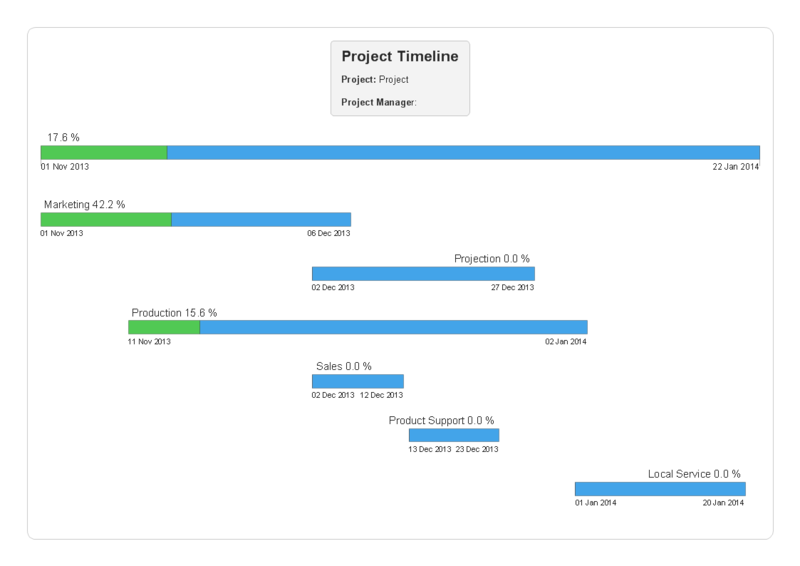 The Timeline diagram gives you a timeline of all your projects and their level of completion on one page. The Milestone Chart shows milestones with dates and relations contained on a timeline. Radial Tasks Structure is an alternative way to visually analyze task structure level by level. The Resource Usage diagram is a multipage document containing resource common loading information and detailed loading for each resource. 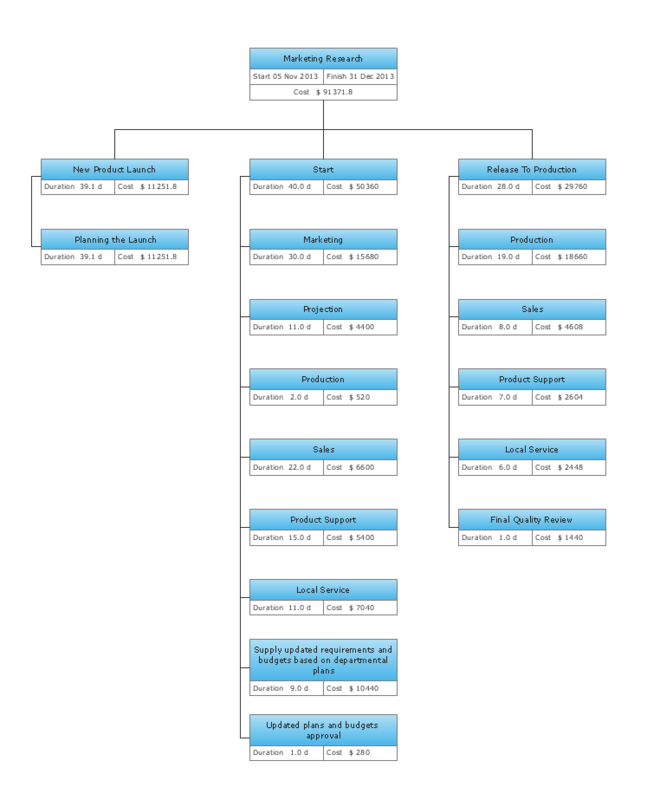 The Work Breakdown Structure shows the deconstruction of a project into smaller components. Transforming project data into different visual forms is a productive way of looking at your project from different perspectives. It also helps you deliver project information in suitable way depending on your objectives and audience. Business calendar is a special type of calendar, it must be functional, convenient for scheduling the affairs and meetings, and also must have strict, official and unobtrusive interface. So you must pay special attention to the business calendar design. Now you don't need to be an artist to design business calendar thanks to the unique drawing tools of Calendars Solution for ConceptDraw DIAGRAM v12 diagramming and vector drawing software. 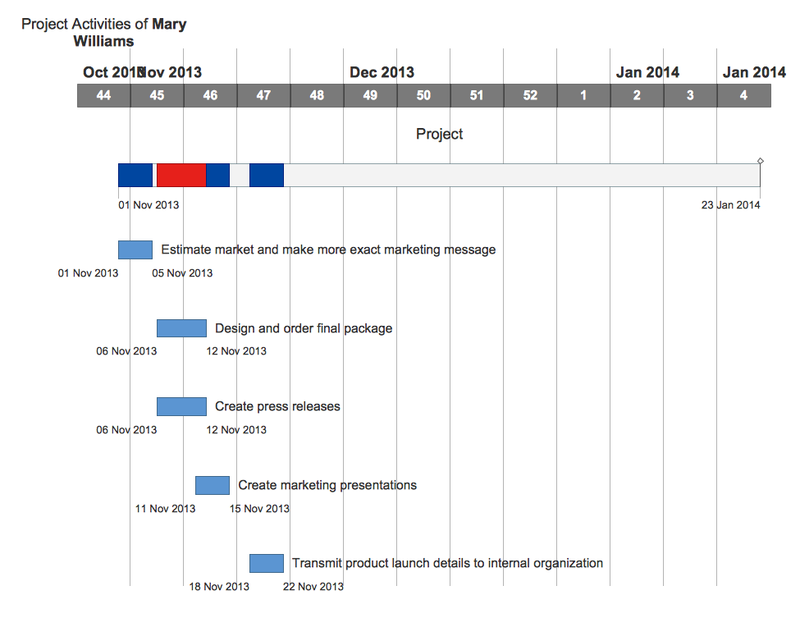 All Gantt charts were made using ConceptDraw PROJECT v9. ConceptDraw PROJECT v9 works both on Windows and Mac OS X. It allows to schedule a voluntary number of projects in a single Workspace document and lets easily share tasks and resources among them. ConceptDraw PROJECT v9 shares files among Windows and Mac OS X. To begin managing a new project, you will need to define the individual Tasks that must be completed to deliver it. 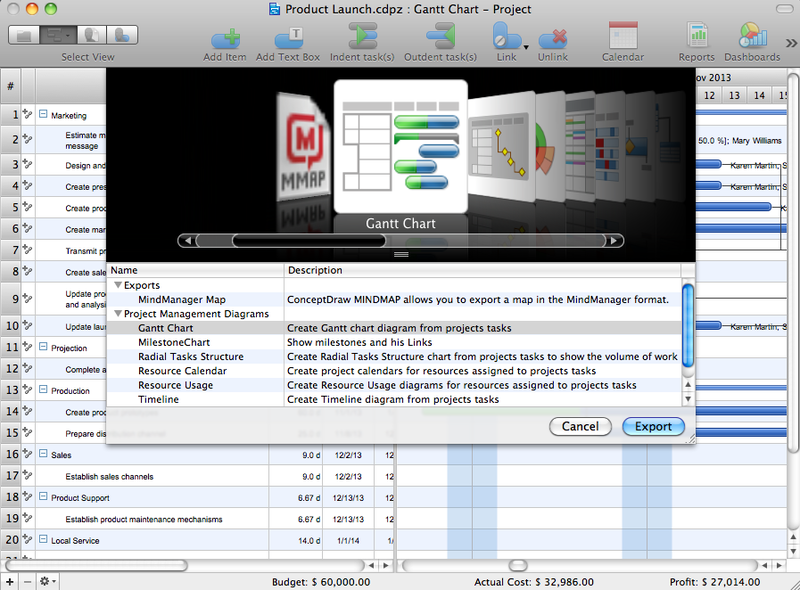 The default view for a new project in ConceptDraw PROJECT v9 is the Gantt Chart. ConceptDraw PROJECT v9 contains an extensive tool set to help project managers. The rich data visualization capability that is provided by ConceptDraw products helps you create project dashboards, one-click reports, multi-project views, Gantt charts, and resource views. Let′s learn how to get maximum value using ConceptDraw PROJECT v9! Activity Network Diagram - This sample was created in ConceptDraw DIAGRAM v12 diagramming and vector drawing software using the Seven Management and Planning Tools solution from the Management area of ConceptDraw Solution Park. This sample shows the PERT (Program Evaluation Review Technique) chart of the request on proposal. A request for proposal (RFP) is a request of the company or the organization to potential suppliers to submit the business proposals for service or goods that it is interested to purchase. The RFP is represented on the initial procurement stage and allows to define the risks and benefits.